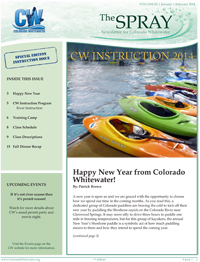 Click on a link below to access previous issues of The Spray, Colorado Whitewater's newsletter. Subscribe below to have the e-newsletter emailed directly to your inbox. We welcome and encourage your articles on topics related to whitewater paddling. Email your submissions by contacting the Spray Editor. Interested in Advertising in The Spray? Contact the Publicity/Advertising Director for rates and specs.